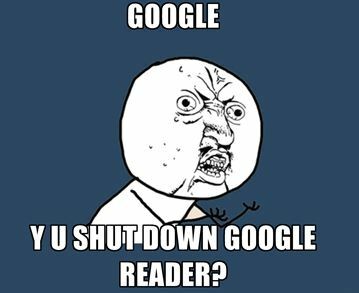 » Google Reader to Shut Down – What to do?! Google Reader to Shut Down – What to do?! By now, I’m sure you’ve heard the news that Google will be shutting down their popular Google Reader RSS aggregator as part of their 2013 Spring Cleaning. At Anvil we love our Google Reader. Seriously though, WE LOVE IT. Beyonce says if you like it you should put a ring on it, believe me, if we would we could Beyonce. So what can be done to keep up on your favorite feeds? Luckily, Google Reader isn’t the only player in the game, it’s just the simplest and there are many other options out there. In addition to these, there is a crowdsourced list of 40+ Google Reader alternatives on Listly. How Can I Move My Feed Subscriptions? It’s pretty easy to export your subscription data from Google Reader and most of the services listed above will allow you to upload a file that will transfer your subscriptions. That’s it, 8 simple steps and you’re back RSS aggregating like a boss!